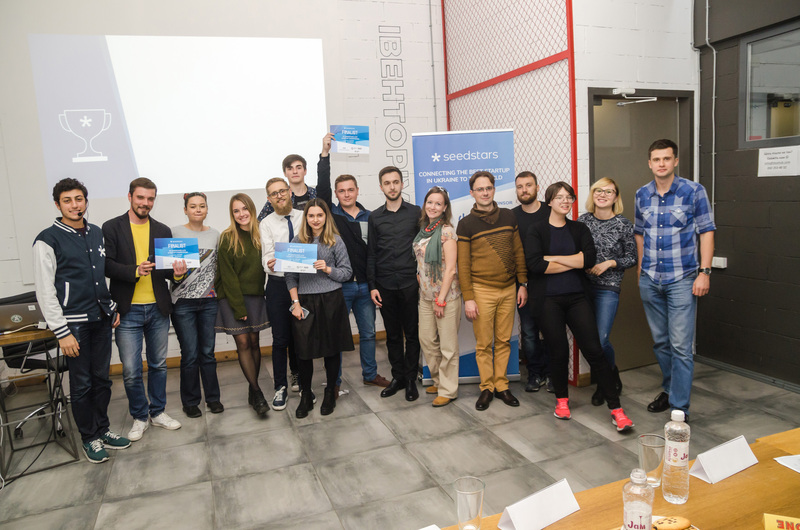 Seedstars has held 4 bustling pitching events in Ukraine, having finally selected 12 finalists to compete at Seedstars Ukraine event, where will be chosen one winner to represent Ukraine at the Seedstars Summit in Switzerland to compete for up to USD 1mn in equity investment and other prizes. Seedstars World, the largest seed-stage startup competition for emerging markets and fast-growing startup scenes, brought its Ukraine round to a successful close during the finals at Seedstars Lviv. The intense quest took place in 4 events, supported by main partner Omidyar Network, local organizer Radar Tech, as well as local supporters Chasopys and 1991 Open Data Incubator. — Priodix.net — artificial intelligence that finds freelance jobs with the highest assignment possibility. — Additive Laser Technology — DMLS 3D printer manufacturer that has its own development of powder-bed-based laser melting of metal alloys. — CleanSpecie — creation of a financial model to a make the cleaning of space debris profitable. — Hive.id — Hive.id empowers consumers to own, control and protect their identity while solving the ever growing fraud problem for businesses. — Marakos — a B2B platform for booking and management of group reservations at hotels and venues. — Beat — a daily project management tool for teams. Easy to use, scales with a person, keeps up to date and saves the time. — LOOQME — a business analytics for public relations function as a service for SMB and regional offices. — Capitan Growth — a first affordable proactive marketing AI which helps businesses analyze marketing data from multiple channels, provide recommendations and tools for automatic implementation. — Creditor Data Platform — a revolutionary data marketplace, which allows individuals and businesses to enjoy transparent data exchange. — Connect.Axsys — a business automation and client retention platform for service oriented businesses, like beauty salons and barbershops, built for not tech savvy people. — UATAG — a unique authentication tag. A solution that offers to complete protection of the valuable items from counterfeiting using unique unbreakable authentication tag and the blockchain. — AgroportEx.Bi — a mobile app, niche B2B market place, which guarantees direct access for buyers from all over the world to proven primary organic producers. As a part of the prize, all the finalists will be participating at the Seedstars CEE Summit in Kyiv and the winner will fly to the global Seedstars Summit, which takes place in Switzerland, in April 2019. It is a weeklong training program, with the opportunity to meet the 65+ winners from other fast growing economies, as well as investors and mentors from around the world. The final day of the Summit is dedicated to pitching in front of an audience of more than 1000 attendees, with the possibility of winning up to USD 1mn in equity investment and other prizes. WIthin the framework of the Seedstars Lviv event, the Associate for CEE and Central Asia, Eugenia Shevchenko, organized a panel discussion, where Andrii Moskalenko (Deputy Mayor of Lviv), Yurii Ogonovskyi (Event Director at IT-Cluster), Tim Aleksandronets (CEO at Blue Carrot) revealed the topic “Civic Tech: What’s On”. “The Lviv City Council is now actively developing such areas as cybersecurity, educational, financial and online technologies. In particular, we are working closely with the European Union on the Open Data project. We are also always glad to partner with different projects from the residents of Lviv,” Andrei Moskalenko, Deputy Mayor of Lviv. Yuriy Ohogovskiy emphasized that among the countries of Central and Eastern Europe, Ukraine is one of the most progressive in the Civic Tech field and one of the most striking examples is the Prozorro project. “I am convinced that if the business has a social component and helps residents solve a certain acute problem, then it will be easy to receive support from local authorities. But the initiative should come from the community”, said Yuriy Ogonovskiy, Event Director at the Lviv IT Cluster." All 4 local events attracted interest from a lot of startups among Ukraine, and around overall 250 attendees. The main support was given by Omidyar Network, local partner Radar Tech, as well as local supporters Chasopys and 1991 Open Data Incubator. Further support was provided by Terminal 42, Odessa 5T, I Coworking Hub, ITEA Hub, Jam’s Catering. Continuing on its world tour of fast-growing startup scenes in emerging markets, Seedstars World’s next stop is Riga at, to organise Seedstars Riga 2018 and select the best startup in Latvia. Seedstars World is looking for smart startups that solve regional issues and/or develop profitable products for the global market. Startups are invited to apply here: seedsta.rs/SSWRiga18af, until the October 24.